For the last fifteen years, the left-oriented academia of Jawaharlal Nehru University (JNU) have been actively promoting and propagating divisive politics aimed at the balkanization of Bharat. The Marxism-infected teachers and ultra-leftist student bodies like the All India Students Association (AISA, student wing of the Communist Party of India (Marxist–Leninist)), the Democratic Students Union (DSU) and the All India Students Federation (AISF, student wing of Communist Party of India), have been fuelling the fire of divisive religious identity and caste-based politics in an unabashed manner. Though in theory, the Marxists debunk religion and berate caste-based politics, in practice they have been following the strategy of crass opportunism in pursuit of their power-grabbing ambition. They openly embrace the communal agenda of minorities and align with regional outfits like the Samajwadi Party, Janata Dal United, Rashtriya Janata Dal, Hurriyet, et al, and espouse their cause. The lionizing of the killers of 76 CRPF Jawans in 2010, the communal-coloured support of the beef festival and encouraging the glorification of Mahishasur in JNU by the leftist cabal were patently anti-national activities of provocative nature. The organizing of a pro-Afzal rally in the JNU on 9th February 2016 was therefore a logical consequence of tightening of the grip of Marxists and ultra-Islamic spies embedded in the prestigious educational institution. Jawaharlal Nehru University Students Union (JNUSU) President Kanahiya Kumar of the AISF and Umar Khalid of the DSU, supported by Shehla Rashid Shora of the AISA, were the prominent organizers of the anti-national function, deceptively organized as a poetry-reading session. They raised seditious slogans lauding ‘Bharat Ki Barbadi’, ‘Pakistan Zindabad’ and ‘Nara-e-Takbeer, Allah-hu Akbar’ for which Kanhayia was arrested while Umar Khalid and many others were absconding till they turned up today in the JNU campus amidst high drama. The preliminary investigation revealed that Umar Khalid, who happened to be the son of a prominent leader of SIMI, had made 800 calls during a span of 8/9 days, including many to Kashmir, Bangladesh and Gulf countries. He had visited a number of Universities and wanted to organize anti-national functions in 18 universities. Interestingly Kanhaiya Kumar, Umar Khalid and many of their ilk have found substantial support among media analysts, while the Delhi police has been showered with nasty verbal brickbats for arresting Kanhaiya Kumar ! We are indeed living in low-grade interesting times. During the UPA rule, the JNU morphed into a weird educational centre dispensing the heady mixture of communism and Islamism to innocent students of impressionable age! A classic example of the Janus like strategy is the dubious conduct of the Vice President of the JNUSU, Comrade Shehla Rashid Shora. Despite being a leading light of the AISA of ‘Lal Salam’ fame, she had conveyed her greetings to the Muslim students of the JNU on the birthday of Prophet Muhammad in the year 2013. She shot into fame among Muslim students with that gesture showing her deep commitment to Islam. After arrest of Kanhaiya Kumar she has tightened her leadership grip by addressing a gathering of 3,000 students on 14th February, 2016, which culminated in a protest march. A 14 minutes clip of her provocative speech was widely circulated on social media sites. According to an AISA watcher, Shehla has emerged as a fiery modern speaker who is likely to outmatch the razor-sharp outpourings of Asiya Andrabi of Dukhtran-e-Millat – albeit minus Andrabi’s black veil ! Shehla is a modern and vivacious lady. Unfortunately, neither the secularism-doped analysts of Bharat, nor the ‘unpaid’ and ‘paid’ column writers have realized that the Fifth Columnists and Fellow Travellers planted by Pakistan have successfully laid a comprehensive siege to Bharat. During the UPA regime, led by the ‘Muslims-Firster’ Dr. Manmohan Singh, several Islamic outfits were allowed to spread the poison of secessionist ideology. A classic example of deliberately encouraging radicalization of Muslims was the decision to allow nearly 25 thousand Wahabbi Ulemas and preachers from West Asia to visit Bharat in the year 2013. In a secret note to the central government the Intelligence Bureau had highlighted that 25,000 Islamic scholars from 20 countries had gone around eight states of Bharat, namely Uttar Pradesh, Rajasthan, Chhattisgarh, Andhra Pradesh, Kerala, Bihar, Maharashtra and Jharkhand. They were allowed to address nearly twelve lakh (i.e.,1.2 million) Muslim youth studying in 7000 registered Madarsas and preach to them the hard-line Islamic doctrines. Their avowed goal was to spread hatred against kaffirs (read Hindus) and motivate the faithful for implementing the Sharia law in Bharat. It is alleged that some pro-Islamism teachers and students from a few universities and colleges had met the visiting Islamic preachers to exchange notes. Some of them had reportedly come from Kashmir valley to interact with the foreign Mullahs. It needs to be investigated whether anyone from the JNU had met and communicated with the radical Ulemas who came from West Asia. In early 2004, a Mumbai-based strategic think-tank, chaired by Sundeep Waslekar, had published a book titled ‘Cost of Conflict Between India and Pakistan’, giving details of the activities of the Inter Services Intelligence of Pakistan in Bharat – largely managed and monitored through thousands of Madarsas (i.e., Islamic seminaries) spread across various states. Waslekar’s research highlighted several sinister aspects of the fast-rising network of the spies planted across Bharat by Pakistan to subvert and destroy the nation of Bharat (read the Hindu identity of Bharat). It drew attention to the virulent anti-national preachings in most madarsas of Bharat encouraged by Pakistani agents. Waslekar’s study contained useful details of the activities of the ISI of Pakistan, presumably culled from a leaked secret official White Paper allegedly prepared during the tenure of Lal Krishan Advani who remained Home Minister throughout the tenure of the National Democratic Alliance (NDA). Mysteriously, the so-called ‘white paper’, originally tom-tomed by L.K. Advani as a great expose of the rising crescendo of the ISI’s footprints in Bharat, never saw the light of day. A fairly reliable source disclosed that one important reason for not publishing the ‘White Paper on the Inter Services Intelligence of Pakistan’ was the fear of losing Muslim votes which Advani hoped to garner. According to the Lutyen’s rumour mill, the former Home Minister was allegedly warned by a left-oriented adviser about the adverse fall out on Muslim voters if the proposed White Paper was made public. According to Waslekar, by the end of 2004 itself, the Inter Services Intelligence (known as I.S.I.) had spread its tentacles all over Bharat by establishing sixty Spying Centres across the country in which nearly 10,000 spies were employed. And most of the ISI operatives were Bharatiyas. As many as nine States, namely Uttar Pradesh, Maharashtra, Bihar, Andhra Pradesh, West Bengal, Tamil Nadu, Kerala and Jharkhand were actively flooded by the ISI modules. Call it an accident or a subtle design, if you will, the 25,000 Maulanas from West Asia visiting Bharat in 2013, too, had majorly focussed on Madrasas in these nine States. Waslekar has explained in his tome how an effective network of radicalization through Islamic seminaries has been spread across the country by the ISI. Sundeep Waslekar of the Strategic Foresight Group deserves to be congratulated for candidly unravelling the highly informative narrative of activities of the ISI across Bharat. The latest discovery about a super spy codenamed ‘Honeybee’ planted in Bharat by the ISI has given a new twist to the narrative of pro-Pakistani fifth columnists and fellow-travellers embedded in Indian polity! Interestingly, the news that the super-spy Honeybee is aided by a retinue of ‘chuhes’ (i.e., rats) operating in Bharat, was broken by Adrian Levy and Cathy Scott-Clarke in their scholarly book, The Seige. It is amazing that the boast of Major Iqbal of the ISI about the cleverly planted Honeybee in Bharat, highlighted two years ago by Adrian Levy and Cathy Scott-Clarke, did not receive serious notice of our intelligence agencies. Incidentally the name of the same Pakistani Major Iqbal also figured prominently in the deposition made by David Headley in the second week of February 2016 before Justice G.A. Sanap of the Maharashtra Special Court. To recap, the well-researched assessment of Sundeep Waslekar asserted nearly twelve years ago (i.e., by the year 2004) the the ISI had successfully set up as many as sixty regular Espionage Centres all over Bharat in which nearly ten thousand trained spies were employed. Well, that was a rough estimate made in 2004. By now the number of active ISI-planted Espionage Centres in Bharat is said to have more than doubled, while the funds allocated for espionage across Bharat have been increased five-fold by Pakistan. These espionage centres constitute formidable spynests of Pakistan’s fifth columnists whose numbers are growing exponentially. The well-organised mini-rebellions in the JNU and Jadavpur Universities emphasize the need to ascertain whether the ISI of Pakistan has succeeded in setting up spynests in some Bharatiya Universities for subverting the nation of Bharat. An associate of Yasin Bhatkal, Danish Ansari, had admitted in a statement that in the year 2010 Yasin Bhatkal had told him that approximately 33,000 mujahideen had been recruited by him all over Bharat and that his close confidante, Waqas, was the outfit’s expert bomb-maker. The statement got recorded under Section 164 Cr. P.C. before a Magistrate by the National Investigation Agency. Yasin Bhaatkal further added that the Indian Mujahideen proposed to take over Bharat, but were handicapped by shortage of weapons. If Yasin Bhatkal’s disclosure is true, his 33,000 jihadis constitute a major internal threat to our national security posed by a formidable army of traitors whose single-minded mission is to subvert Bharat. To these may be added the 25,000 traitors who applauded Akbaruddin Owaisi’s sedition-laden speech on 22nd December, 2012, at Nirmal in Adilabad (erstwhile Andhra Pradesh) and the over 40,000 mobsters of the Raza Academy who started a riot on 11th August, 2012, in Azad Maidan, Mumbai. Apart from battalions and brigades of fifth columnists, Pakistan has also planted a huge army of termites in the guise of fellow-travellers in the woodwork of secularism-doped politicians and ‘paid’ media. These Quislings constitute a dangerous group of politicians-turned traitors whose single-purpose mission is to subvert Bharat and Islamicise the entire sub-continent. In a very perceptive analysis about the future turns and twists in Bharat’s polity, the well known U.S. based strategic analyst, Selig S. Harrison, had conveyed a dire warning as early as 1960 in his book, ‘India: The Most Dangerous Decades’. He had predicted that in the coming decades due to machinations of Indian communists the centrifugal forces will gather momentum which was likely to break Bharat into a number of states. He prophesied that the Indian communists will play a major role in balkanising Bharat by manipulating the destructive casteist and regional political outfits. He persuasively argued that the growth of regional parties will result in the emergence of regional supremos whose political careers will not depend on their loyalty to the State of Bharat. They will draw political power from their pretensions to satisfy the regional demands, even at the cost of harming the national interests. The communists will play a decisive role in eroding democracy in Bharat. In his well researched treatise, Harrison had specifically marked out the communists as a major force seeking destruction of the unity of Bharat by fanning a divisive maelstrom. Harrison’s forecast about the communists trying to destabilize Bharat by supporting the separatist and casteist political groups seems to be coming true. 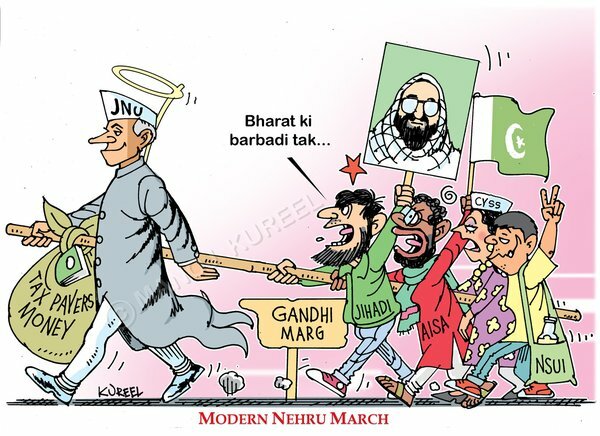 Time has come for the intelligence agencies to step up vigilance on radical leftist outfits and associated Islamic groups who shouted slogans eulogizing ‘Bharat Ki Barbadi’ and ‘Nara-e Takbir Allah-hu-Akbar’ in the JNU on 9th February, which was followed next day by preaching sedition at the Press Club of India under the stewardship of SAR Geelani and his henchmen. This diabolical conspiracy hatched in collusion with foreign elements must be thoroughly investigated and prised open to convey a timely warning to the masses in Bharat about the malefic design of the communist outfits strutting across our Universities to divide and destroy. The slogan, ‘Jang rahegi, jang rahegi, Bharat ki barbadi tak’ (war will continue till Bharat is destroyed) shouted in the JNU campus sums up the goal of communists bonding with Islamic radicals. IPS ( Retd I.G./Arunachal Pradesh) Shri R.K.Ohri, is a retired IPS officer who was Inspector General of Police in Arunachal Pradesh. He has taught in Internal Security Academy of CRPF and in Bureau of Police Research and Development. He was also Secretary of Association of Retired IPS officers. He has authored several books including 'The Bell Tolls, Tomorrows Truncated India'.